A couple of weeks ago, while looking in the library for recent books on Vancouver's elevated light rail system, I came across SkyTrain Explorer by John Atkin. After flipping through it a bit, and reading some of the books descriptions of Vancouver neighbourhoods surrounding SkyTrain stations, I decided to give it a try by checking out the area around Nanaimo Station, and documented it with photos and commentary. 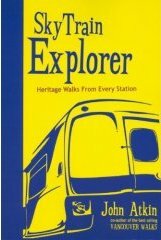 I've even created a section for SkyTrain Explorer (it uses the 'expanded book' PHP snippet found on Drupal.org) in case I go on more heritage walks outlined in the book, and I plan on doing at least one chapter a month. The author's website, Vancouver Walking Tours, though it looks like a 'static' website, upon close inspection he appears to update it frequently with the walking tours he conducts, not only in Vancouver but in other cities. If I can steal some time from work and other pursuits, I'll try to go on some and document them, possibly using a friend's video camera. I've been living in this city for 10 years now, and don't really know the place. Walking around on guided tours—either self-guided or tour-guide-guided—should help shake the feeling that I'm missing something really great.